Father Adam Cichoski celebrates his first Mass May 21, 2017, at Saint Teresa Church, Holy Child Parish, in Runnemede. The church’s sexual abuse crisis forces young men to think hard about what it means to be a priest today. Father Edward Kennedy at his ordination Mass in the Cathedral of the Immaculate Conception, Camden, on May 21, 2016. 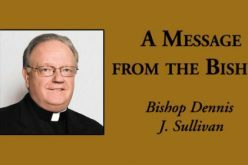 What is a priestly vocation? The question is vitally important, especially to Catholics struggling with their faith as they read stories of priests who have abused children and youth, and stories of bishops who put the church’s public image before the welfare of their flock. Although new incidences of abuse are rare, what has become public of past allegations and cover-ups – for example, in the Pennsylvania Grand Jury Report this past summer – is shocking. “This drama of abuse, especially when it is widespread and gives great scandal — think of Chile, here in Ireland or in the United States — has behind it a church that is elitist and clericalist, an inability to be near to the people of God,” the pope said to Jesuits during his trip to Dublin in August. Why then, today, would a man choose to become a priest? Although the percentage of priests who abuse children is small, commentators and late night comics don’t deal with nuances, often portraying the Vatican and the entire priesthood as organized pedophilia ring. This is the world a man rises to after laying prostate before a bishop on his ordination day. For Father Edward Kennedy, that day was just two years ago, in 2016. 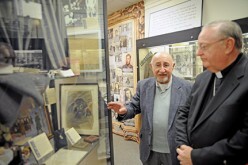 Currently serving as parochial vicar at Our Lady of Hope Parish, Blackwood, Father Kennedy called the Pennsylvania report and related stories “heartbreaking,” but they have not caused him to question his vocation. “I have more resolve now to be a good, holy priest, who is serving the Lord and my parishioners,” he said. Father Kennedy had the advantage of having priests in the family. 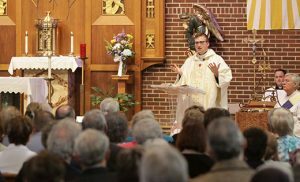 “Two of my cousins are priests in this diocese, and they were examples for me of what the priesthood is all about,” he wrote in a 2014 piece for the Catholic Star Herald, while he was in formation. “I saw the joy that their vocations brought to their lives. I saw the way they brought joy to people’s lives when they celebrated weddings, and the comfort they brought to people when they celebrated funerals,” he wrote. 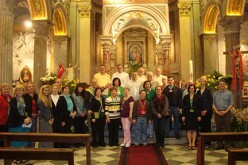 “And that is certainly what a vocation to the priesthood is, a call to something radically different,” he wrote. 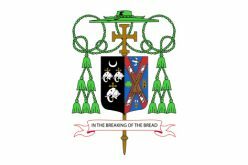 Father Adam Cichoski, who was ordained last year, summed up in a few words both the needs of the entire “priesthood of the faithful” and the unique role of the ordained. “We need Christ, and we need the sacraments” he said, including priests — who alone can administer the sacraments — among the community of the faithful. 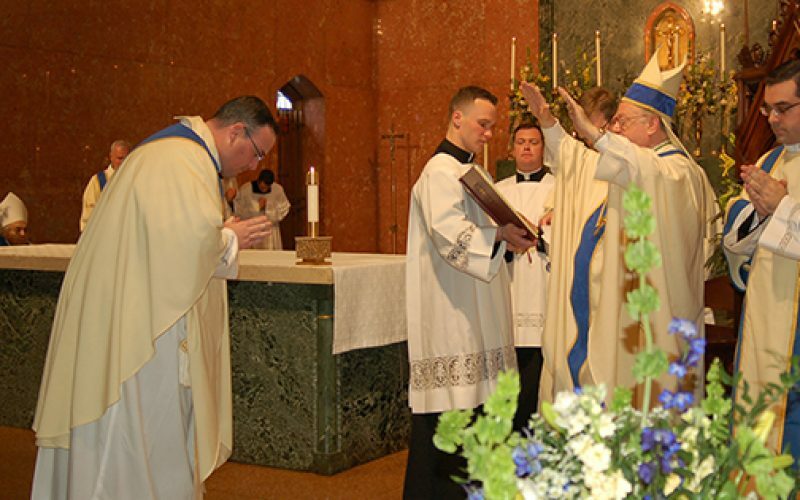 Father Cichoski is currently serving as parochial vicar at the Parish Shrine of Our Lady of Guadalupe in Lindenwold. It is his first pastoral assignment in a life of active ministry that will likely span several decades into the future. For a man to get to that point, to the day when a bishop confers the sacrament of holy orders by the laying on of hands, involves a long and deliberate process. 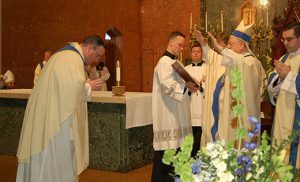 The program of priestly formation takes approximately six years for those men who enter with a college degree, and around six to eight years for those entering right out of high school or at some point during their college studies. And that’s after a period of discernment. Father Michael Romano, director of Vocations for the Diocese of Camden, was a young seminarian when reports of the church’s “sexual abuse crisis” became a staple in the news media in 2002, and he was ordained in 2007, five years after the scandal in Boston led to Cardinal Bernard Law’s retirement. And yet, he observed, the bad publicity had an unexpected consequence. “While it certainly made the decision to enter the seminary even more difficult for those who came after I did, I noticed immediately that the quality of those entering kept getting more impressive. Those men knew what the priesthood was supposed to be about and desired to live that to its fullness,” he said. Others who know and work with seminarians and young priests also spoke of being inspired by their example, and of seeing hope for the future of the church because of them. 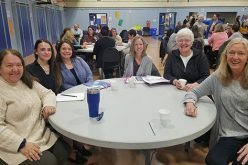 “Their love for God and desire to build his kingdom is especially evident in the way they care for those in our parish communities,” said Laurie Power, director of evangelization and discipleship at Christ the Redeemer Parish, Atco. To help a man determine if he has a calling, the Office of Vocations runs a number of discernment programs, including ones tailored for high school and college age males, and will help him find a spiritual advisor. Then, if a man is so inclined, he can apply to be accepted as a seminarian. Only once a man has completed an undergraduate degree, with a suitable background in philosophy or pre-theology, will he begin four years of highly specialized seminary study: Scripture, Trinitarian Theology, Christology, Pneumatology, Ecclesiology, Moral Theology, Liturgy and the Sacraments, Church History, Canon Law, and Homiletics. In addition to coursework, a seminarian’s formation includes daily Mass, adoration, days of recollection, apostolic work and devotions. Throughout his period of discernment and formation, a man knows he is preparing not for a career but a vocation – one which does not include a wife or children. And he knows, throughout this long process of self-examination, that he can literally walk away at any time. Not surprisingly, then, that young priests, when asked about reaction to church scandals, express a mixture of disappointment and personal resolve, as well as faith in the future of the church. “The good that will come out of this is that the church will be purged of all evil, of those not serving the church,” said Father Kennedy, who noted the importance of praying for victims. “The Lord will prevail,” he added. “God is cleaning house,” said Father David Rivera, parochial vicar at Saint Mary of Mount Carmel Parish, Hammonton, who was ordained in 2010. “We’re not sure how many rooms are left in this house.” Saying the church now has a “credibility problem,” he called for more “accountability and transparency” from church leaders.